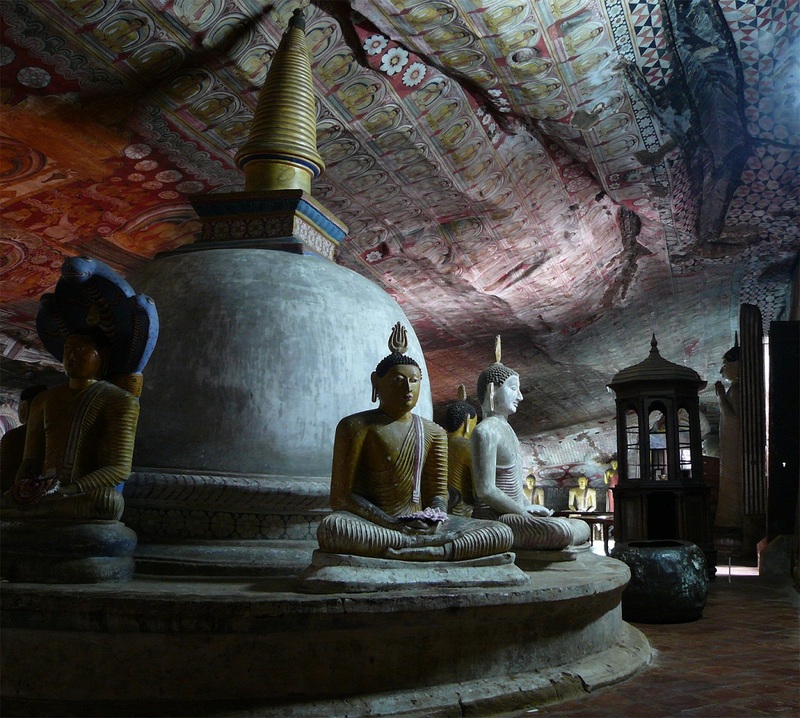 The Dambulla Cave Temple, also known as the Golden Temple of Dambulla, is a UNESCO World Heritage Site and perhaps one of the largest cave monasteries in the island country of Sri Lanka. It is located 148 km east of Colombo and 72 km north of Kandy. 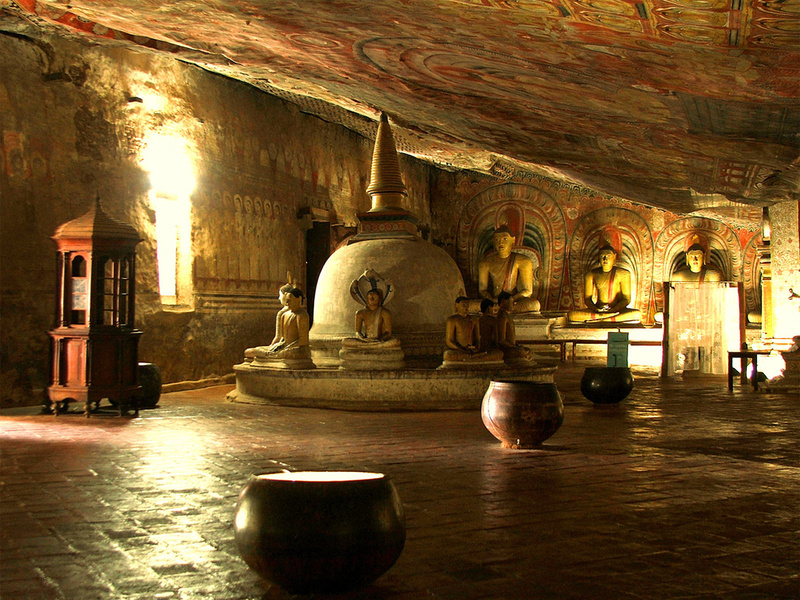 The Dambulla Temple has been a sacred pilgrimage site for the last 22 centuries. The cave temple complex is very well preserved, spanning over an area of roughly 2100 square meters. 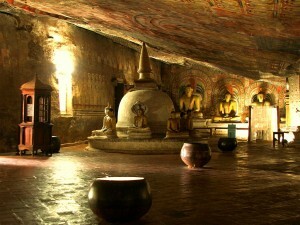 It is believed that King Vattagamini (103 BC and 89-77 BC) had the temples constructed after having reclaimed his throne in Anuradhapura. 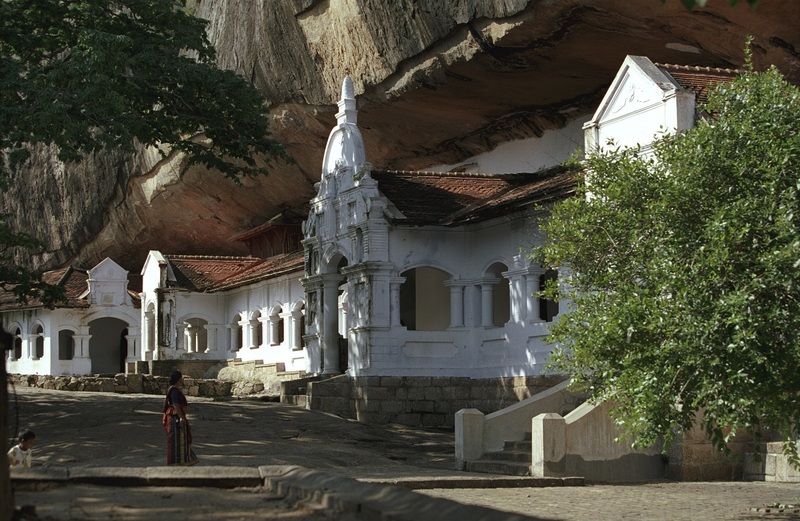 While comprehensive restorations and remodeling was carried out by future monarchs, it was King Kirti Sri Rajasinha (1747-82) who commissioned the vast number of murals that now adorn most of the interiors of the cave. The temples are cut out of a huge granite outcrop that towers almost 160m above the surrounding plains. The site has five major caves which consist of 153 Buddha statues, 3 statues of Sri Lankan Kings and 4 other statues of various deities. 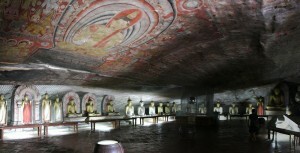 The paintings and murals that cover the caves share a common theme and are generally depicting the life and enlightenment of Lord Buddha. 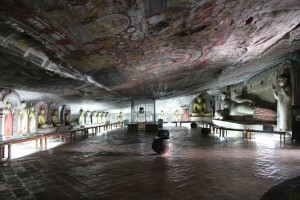 Cave 5 known as the Devana Alut Viharaya (Second New Temple) is the most modern of the temples. 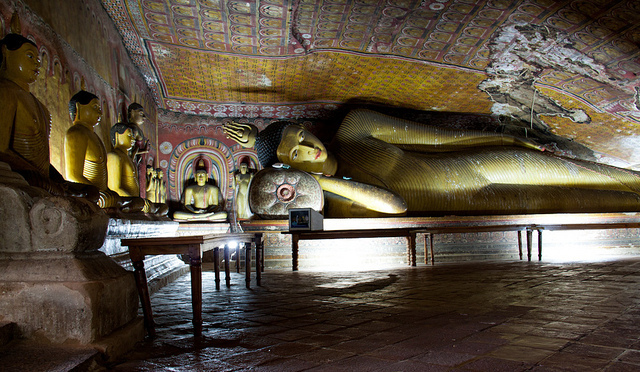 Unlike the rest of the site which is fashioned from solid rock, most of the statues and images here are made from brick and plaster. 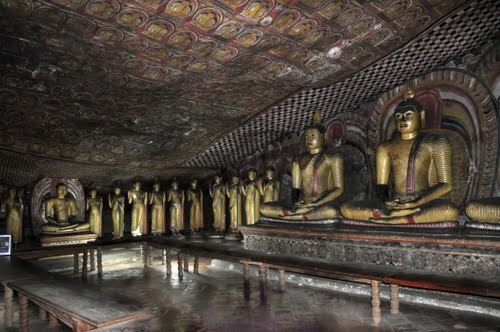 Cave 4, the Paccima Viharaya (Western Temple) is relatively small and features several Buddha statues seated in a meditating posture around its walls. Cave 3, the Maha Alut Viharaya (Great New Temple) is on a far grander scale and boasts of solid rock statues that were intricately hand carved using just rudimentary chisels. Cave 2, the Maharaja Viharaya (Temple of the Great Kings) is the biggest and most spectacular one in Dambulla. 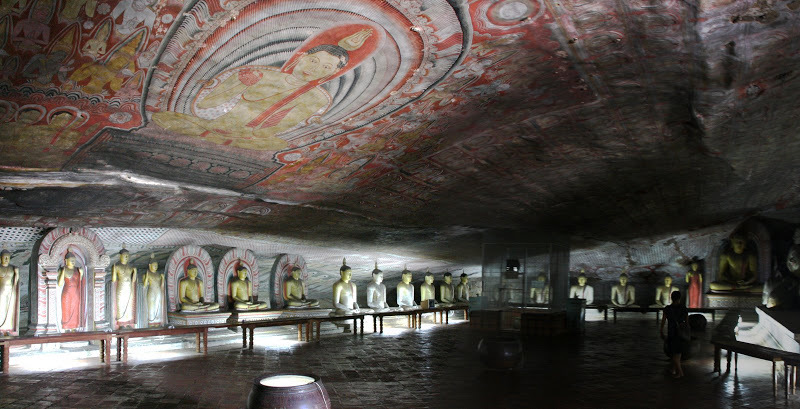 Besides the magnificent statues, its ceiling and walls are covered in a fabulous display of murals titled Mara Parajaya (Defeat of the demon Mara). 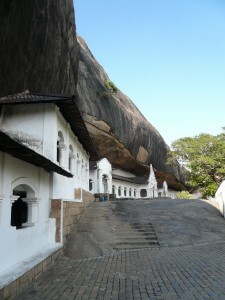 Finally, Cave 1 known as the Devaraja Viharaya (Temple of the Lord of the Gods) is dedicated to the Hindu Lord Vishnu. 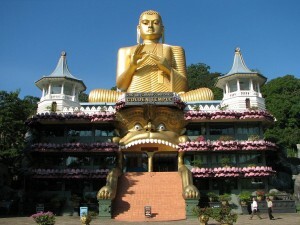 At the steps leading to the cave temple lies an exquisite 30m long golden statue of a seated Buddha. Alongside the foot of the golden statute there is also a museum with several paintings and artifacts from around the world.